The giant robots in "Pacific Rim Uprising" could learn a few things from real-life robot and exoskeleton research. 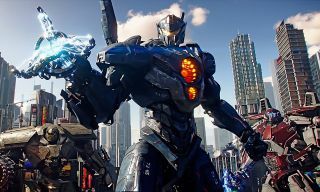 Although "Pacific Rim Uprising" topped the domestic box office this past weekend, the film's giant robots (also known as Jaegers or mechas) could use a lesson from real-life science, writes one robotics researcher. Both this film and its predecessor, "Pacific Rim" (2013), show building-size robots controlled by a pair of military pilots. The pilots stand inside the robot, establish a telepathic link with each other and then walk, punch or make other movements with their bodies. The robot reflects their actions, providing supreme power in the franchise fight against extraterrestrial monsters called Kaiju. "It doesn't connect with my research per se — my area of expertise is disaster robotics," Murphy told Space.com in an email. "But I love using science fiction as a framework to teach robotics and artificial intelligence. "I have a textbook called 'Robotics Through Science Fiction' coming out this fall," she added. "So the paper reflects my finding a 'teachable moment' in the 'Pacific Rim' movies. My conclusions are based on my general background in robotics, and writing a best-selling textbook, 'Introduction to AI Robotics.' The second edition is also due out this fall." The column points out that the robots of "Pacific Rim" require an extraordinary amount of pilot time and effort to walk and run, because the operators manually control the robots' actions in locomotion. In the real world, however, such a robot can usually take on these actions themselves. Some robots are extremely flexible and can recover from slips or falls, such as the Boston Dynamics BigDog robot, the paper stated. As for the telepathy the pilots use, Murphy's reaction was an emphatic "Nooooo!" She added, however, that the idea of telepathy and giant robots has also been used in a novel called "The Themis Files" (2017), by Canadian science-fiction writer Sylvain Neuvel, so it's not fully unheard-of in fiction. "The telepathy/mental bonding between the pilots definitely is a weakness from the science side," she explained, turning back to "Pacific Rim." "The whole idea of having two pilots to divide up control, and then have to synchronize between themselves, is not realistic … Two pilots is not realistic, but it does allow for the story to have interpersonal conflicts and such." Another weakness of "Pacific Rim" is it doesn't show the possibility of rehabilitating exoskeletons. For patients with muscle disorders or others who need assistance with walking, entities ranging from NASA to DARPA have investigated the use of robotic exoskeletons. But this usage is rarely seen in science fiction, Murphy said. "Most of the franchises are promoting exoskeletons as battle suits — 'Avatar,' 'The Day After Tomorrow,' 'District 9,' 'Robot Jox' — rather than assistive systems, either to help prevent injuries or to enable greater performance. [There is] the exception of the power lifters in 'Aliens,' 'Elysium' and, yes, 'The Lego Movie.' Movies totally ignore the use of exoskeletons for rehabilitation or orthotics." Murphy said information about "Pacific Rim Uprising" and other fantasy robots is available on her website, roboticsthroughsciencefiction.com. The website includes a week's worth of trivia, quizzes, reviews about exoskeletons in science fiction and information about the use of exoskeletons in real science.